Austrian traveler and Arabist; born March 15, 1855, at Deutsch-Rust, Bohemia. After completing his elementary and college education in Komotau and Prague, he studied mathematics and geodesy at the Prague polytechnical high school and devoted himself privately to the study of Arabic. In 1877 he went to Vienna; in 1880 to Tunis; thence in 1882 through Tripolis to Alexandria; and in 1883 to South Arabia, which he crossed in various directions. In 1885-86 he undertook a second, and in 1887-88 a third, trip to Arabia, succeeding on his last journey in penetrating to Marib, the ancient Saba. Glaser collected more than 1,000 Himyaritic and Sabean inscriptions, and made important geographical discoveries. 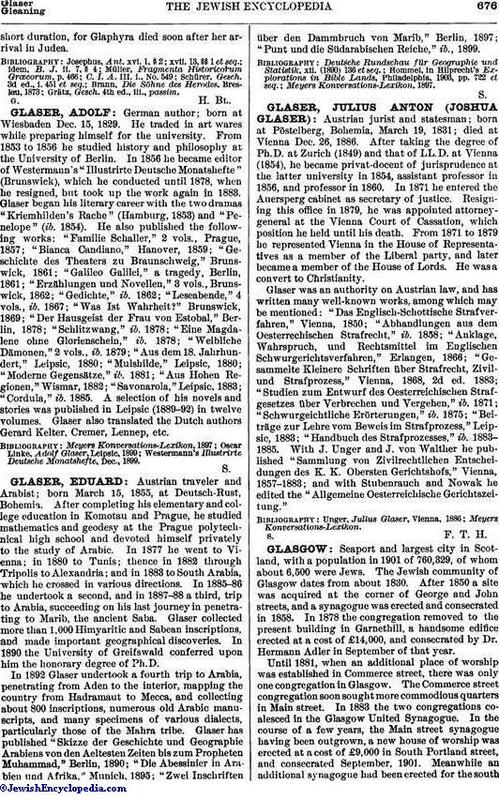 In 1890 the University of Greifswald conferred upon him the honorary degree of Ph.D. In 1892 Glaser undertook a fourth trip to Arabia, penetrating from Aden to the interior, mapping the country from Hadramaut to Mecca, and collecting about 800 inscriptions, numerous old Arabic manuscripts, and many specimens of various dialects, particularly those of the Mahra tribe. Glaser has published "Skizze der Geschichte und Geographie Arabiens von den Aeltesten Zeiten bis zum Propheten Muhammad," Berlin, 1890; "Die Abessinier in Arabien und Afrika," Munich, 1895; "Zwei Inschriften über den Dammbruch von Marib," Berlin, 1897; "Punt und die Südarabischen Reiche," ib., 1899.